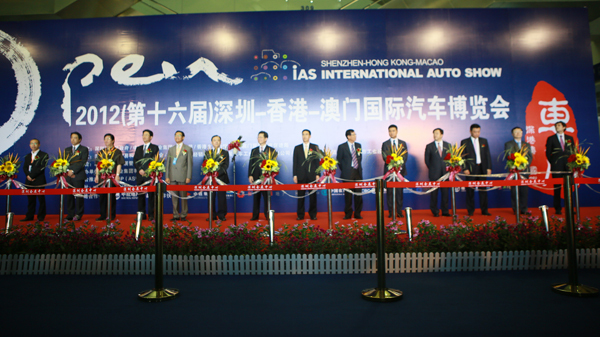 On 7th Jun 2012, 16th Shenzhen-Hong Kong-Macao International Auto Show (SZ-HK-Macao IAS) themed "vanguard city, auto citizen" grand opened in Shenzhen Convention & Exhibition Center. CNAICO’s President Mr. Ji Xue-Cheng attended the opening ceremony and cut the ribbon with the relevant leaders. Represents the organizer of the show, Mr. Ji Xue-Cheng give speech on the opening ceremony, he reviewed the history of SZ-HK-Macao IAS in the past 15 years, from the begging of three shows in one city to the combination of the three shows, and finally to the alliance of the three city. The growth of the show, crystallized the wisdom and support from manufacturers and dealers in auto industry, as well as from local government, media and all walks of the society. Make effort to promote the fair into a grand event not only in auto industry but also in south China. Mr. Ji said CNAICO will join hands with the other organizers，aim to make SZ-HK-Macao IAS a world class show. The Exhibition has an area of 110，000 sqm , over 1000 displaying cars, and over 600,000 visitors, which gained high status and reputation in the auto exposition field. Highlights of the show: Over ten concept cars, brand-new products were first presented, independent Audi pavilion, World extreme luxury car brands with its over hundreds of news conference. Brand such as Aston Martin ONE-77 (around 47million RMB) gain its popularity during the show. To make a better environment, the show forbad high-pitched, and high frequency sounds. Shenzhen-Hong Kong-Macao International Auto Show is supported by Shenzhen Municipal People's Government, China National Machinery Industry Corporation (SINOMACH), Hong Kong Productivity Council (HKPC), Macau trade and Investment Promotion Bureau, Organized by Economy Trade and Information Commission of Shenzhen Municipality, China National Automotive Industry International Corporation (CNAICO), China Ocean Aviation Group Incorporation, Automobile Dealer Association of Shenzhen, Federation of Shenzhen Industries, undertake by Shenzhen United Auto Show Management Co Ltd.